I couldn’t help noticing a trend in my after-Thanksgiving shopping binge, and I do so love a good theme. Those after-Thanksgiving sales just slayed me, friends. What’s a girl to do when the Givenchy wallet you’ve been coveting for a year is suddenly 40% off? Buy, that’s what. Though now, it’s actually 60% off – sigh. Sometimes sale shopping is a big game of Chicken. And really, I blame Miss Kate for the driving mocs. I was living a blissful, loafer-less existence until she came along and showed me the light. Anyway. Remember those red pants I just had to have this summer? They were fun, don’t get me wrong, but they’re just absolutely everywhere now, so it’s time for my pair to take a hiatus. 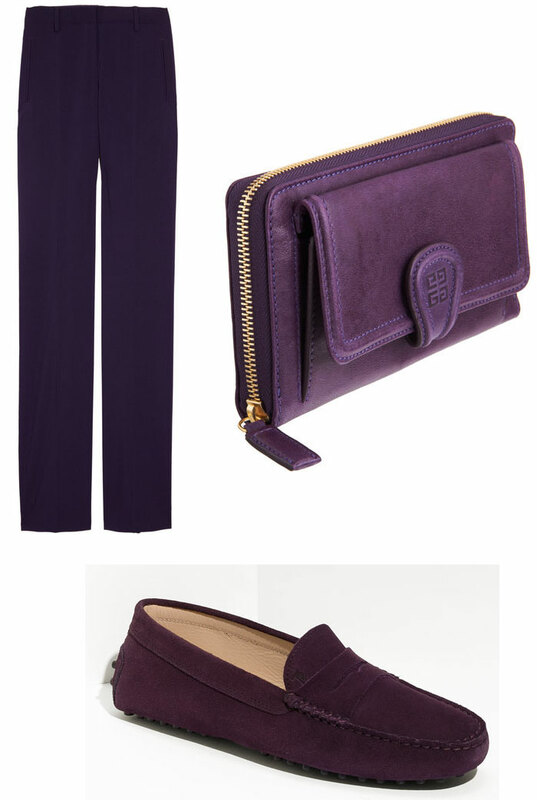 My new love is this pretty pair in purple. At 70% off, it was an easy splurge, and they’re right at home in my closet. As it turns out, purple – especially a deep, rich purple like this – is considerably easier than red. It adds color and richness without screaming “Hey, you there!”, or straying too far from my beloved neutral palette. Neutrals are an easy pairing of course (I love this shade with navy, grey and camel), but purple also plays well with all sorts of patterns, which can get a little loud when paired with red. If I’m honest, I’m still on the fence about those loafers, which usually means a return is imminent…but they’re awfully cute sitting in my closet. What are you thinking about purple these days? Does it give you flashbacks from 3rd grade, or are you ready to give it another chance? And was anyone else as bad during those Black Friday/Cyber Monday sales as I was? Gluttony loves company! This entry was posted in accessories, shoes, styling, trends and tagged givenchy, philosophy di alberta ferretti, tods on 21 December, 2011 by shoppingsmycardio. Today’s guest post comes from a favorite blogger of mine, Kate of Anonymous Chic. She’s a first-class writer with serious style, and she’s not afraid to speak her mind. Oh, and she’s Canadian to boot (which means, among other things, that she gets to spell “colour” with a “U” – jealous!). With all that going for her, I knew she’d fit right in. So, I was thrilled she agreed to school us on a topic near and dear to my heart this time of year: fall footwear. Fall and winter are a time for indulgence in fabulous boots, but I refuse to lock myself into one footwear genre for two entire seasons…and I’m sure I’m not alone in that opinion. My go-to solution once the colder months roll around is a great pair of loafers. They are absolutely appropriate either barefoot or paired with socks (my inner preppy craves subtly coloured argyle or bold stripes). The great thing about loafers is the degree of creativity that they allow. No matter your taste, there’s a pair for everyone. A key when considering them for colder months is their level of “weather appropriateness”. I live in that snowy place north of the 49th parallel (…that’s Canada, for those of you who are geographically challenged), so I’ll always opt for something with a good structured sole and patent leather. The only time I break that rule is when I’m looking for a good excuse to change out of horridly practical winter boots, but into something that still accommodates comfort and warmth. 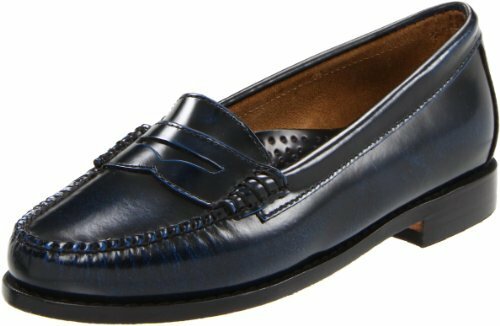 Considering there’s a serious collegiate kick in a lot of Fall/Winter styles this year, loafers are the kind of nostalgic nod that could be a practical and fashionable addition to your footwear wardrobe. At one end of the spectrum lies your “fits like a glove” driving loafers. These are the pairs I’d recommend if you’re looking for something stylish for a commute that isn’t slippery, or as something comfy to change into at the office. The defining pair from this category is clearly Tod’s, definitely an investment piece in any wardrobe, but I will testify, they are well worth saving up finding your favourite. 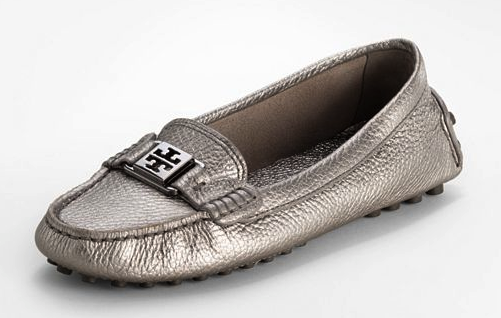 Tory Burch has recently done a couple of great metallic versions that definitely add a little subtle sparkle to the mix if you’re look for a petite bit of pizzazz for these bleak months. 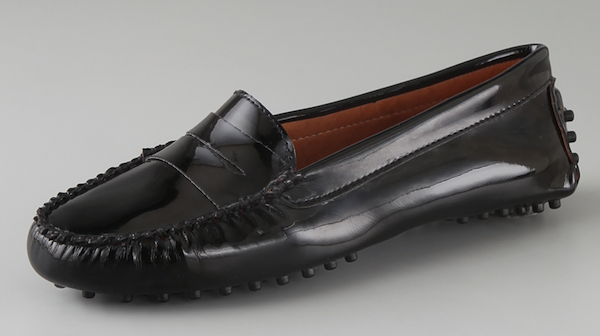 If you’re in the mood for something more weather-friendly or structured, head to the classic penny loafer. Bass or Sebago are classic preppy staples (the addition of a shiny new penny is absolutely optional). 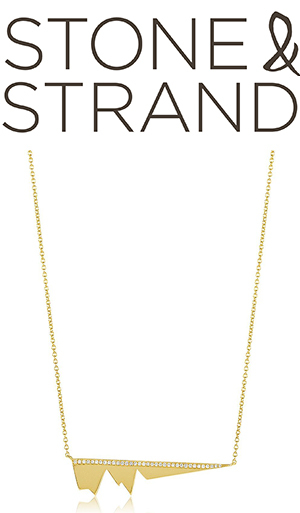 I’m thinking that this version in navy might be the next addition to my collection. 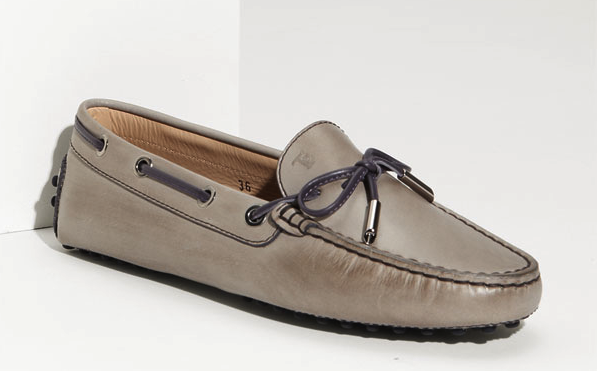 Another great option comes courtesy of Cole Haan. 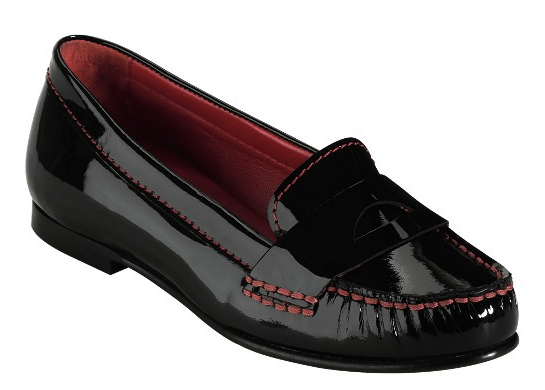 Great colours and contrast stitching, coupled with patent leather, equates to positively weather-friendly options. Two-tone options are also available if you’re up for being a touch more daring. Need an in-between option? This patent leather version from Jeffrey Campbell will work for wet weather, and the driving loafer style means that you’ll feel as though you’re taking your daily stroll in custom-fit slippers all day. Whatever you choose, here’s hoping that a great pair of loafers can be added to your fall and winter footwear fashions. 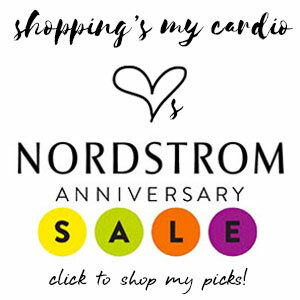 This entry was posted in fall, guest posts, shoes and tagged bass, cole haan, jeffrey campbell, tods, tory burch on 17 November, 2011 by shoppingsmycardio.